Lightweight smooth finish card stock Golf frames hold Polaroid 600, 667, 668 and Spectra prints. Three-panel construction folds to create easel frame. 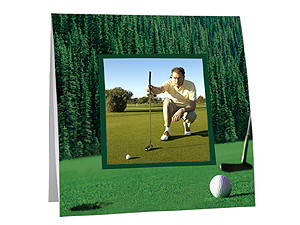 These Golf Polaroid Easel Frames are great for any golf outing or tournament. Use as is or imprint with your company logo and text for your corporate golf event.